Hi. 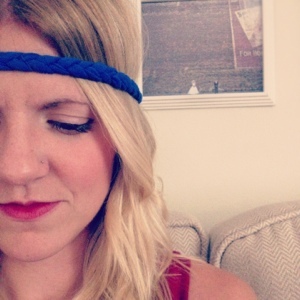 My name is Mindy, and I am an Olympic-aholic. For weeks I have been looking forward to seeing those rings on NBC and hearing the "Dum dum da dum dum dum da dum dum dum dum"(if you can't hear the song when you read those words, you need to watch some Olympic coverage). 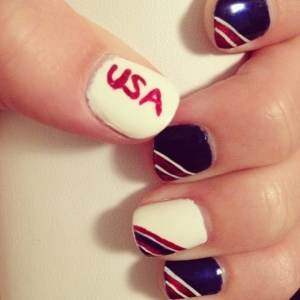 In order to prepare for and build my own excitement for the opening ceremony I painted my nails to start getting in the Olympic spirit. Finally, the big day rolled around and I decided to dress accordingly for the opening ceremony; ready to cheer on my country. My sister made me pose for a pic saying, "I need to capture this. My sister in full swing. Yup that's my sister". She gets quite a kick out of my style sometimes. Now that the opening ceremony is over and the events have begun, I'm not going to lie- I'm kind of like a kid in the candy store when the Olympics are on. I get all sorts of excited at the idea of watching all the different events. 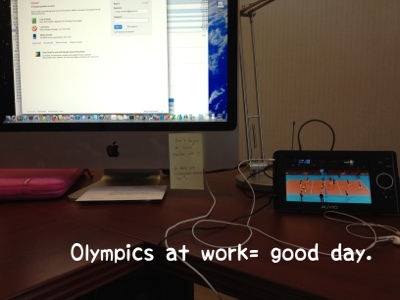 I was pretty excited today because I was able to bring a portable tv for my desk to watch the Olympics while at work. No complaints here. I am not sure when it all began, but I definitely have an addiction to the Olympics. There's something extremely beautiful about watching the world come together in one place, even if it is to compete against each other in athletic events. Besides my love for sports, especially volleyball, maybe underneath it all it's the idea of a sample of all of God's people coming together in a peaceful manner. While watching the opening ceremony my sister commented, "I bet God loves the Olympics... I bet He's proud." Well wouldn't he be? I mean sure, competing against each other can end up getting a little ugly if people get upset or mean or something. But overall, it's pretty cool that people from all over the world are in one place. It's like a tiny sample of what heaven will be like right? A melting pot of every country come together for the same great purpose. Regardless of whether it's my love for sports, or the coming together of all the countries- I am hopelessly in love with the Olympics. There is something nostalgic or comforting about the voice of Bob Costas, or the sound of the Olympic theme song. I'm quite excited for the days and nights left of quality time spent in front of the TV living vicariously through these athletes who compete to be the Best at what they do. As the torch goes out in 2 weeks, it will be a sad moment until excitement re-builds and we come together again to watch the world compete in the winter Olympics in 2014. So tonight... go home, spend some time with Bob Costas and join me in my love for the Olympics.